It’s too late when you’re 60 to find out the assumptions you made at 40 about your money were incorrect – and worse yet, to need to start work again after you’ve been retired for a few years. As humans, we unconsciously live our lives based on many assumptions. As a wealth adviser, I deal daily with people who are making huge financial decisions they’re not even conscious they’re making. These are some of the most common assumptions I see. 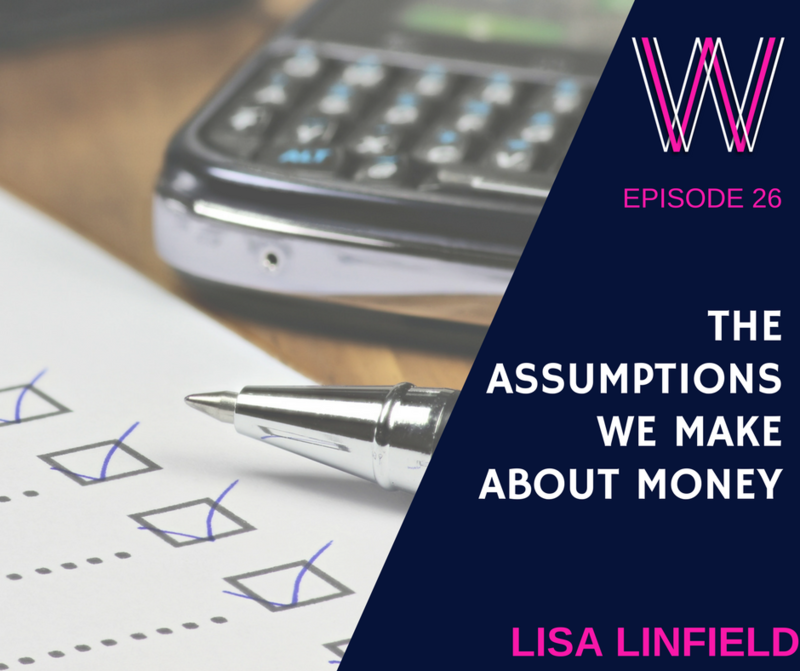 Lisa Linfield: 00:00 Welcome to Working Women’s Wealth where we discuss what it takes to build real wealth in a way normal humans can understand. Here’s your host, Lisa Linfield. Hello everybody and welcome to this week’s episode of Working Women’s Wealth. I have had many amazing guests on my show and learned so much from so many of them, but this week I had a key pivotal insight that actually came through an interview that I was being interviewed on as a guest on someone else’s show. I was talking about the philanthropy work I do where I teach domestic workers about how to manage their money better. And I was talking through this process and I passed a comment or as part of kind of one of the sentences I said is that what we really do through that process is challenge people on the assumptions that they make about money. So an the example I gave was we talk a lot about this kind of consumers culture, the fact that, and one of the woman bravely said, well we’re all sitting here today and we all do the same job. So roughly we must own all the same amount of money and I see that Mary has a great cell phone and I think to myself, well, if she can have that great cell phone, so can I. And we were talking about this assumption. So I say to her, what are you assuming about that? So she said, what do you mean? And we went through the steps of the assumption about it and it came down to the fact that first of all, you’re assuming that you and Mary earn the same amount of money. You might do the same job, but Mary might have a great employer and be paid double what you are paid. The second thing is that you’re assuming that although you’re in the same revenue that you have the same expenses. You might have four children, you need to support and a parent and Mary might have no children and no parents to support only herself. The other thing you’re assuming is that you both have the same assets. You both have your retirement sorted, et cetera. You might not have your time sorted, but Mary might have her retirement sorted so she can have a little bit of wiggle room in terms of where she’s been her money. And as I closed the section on assumptions, the host said to me that’s really key. And I paused and she said the assumptions we all make about money and I guess it’s part of the courses I teach. It’s part of what I do, but it really struck me that this was a kind of Aha moment for her in terms of the assumptions about money. So I thought I’d spend a time with you and kind of challenge you on assumptions because as you all know, the assumption is the mother of all problems and to assume is to make an S out of your need. A-S-S-U-M-E, assume. So there are many different things about it, but we should take it a little bit more seriously. There’s a book I love by Nancy Kline and she says, the quality of your thinking determines the quality of your doing or your actions. And so often in life, we have actions that are based on subconscious assumptions or paradigms of the world that we never stopped to question because the reality is our sub consciousness is impacted by so many sources that we don’t even kinda think about. The media tells us that to be pretty unique you need to be almost anorexic and have a figure like Barbie who if she lived in real life, would not even be a human being with those dimensions and your parents give you worldviews, your friends give you worldviews, stupid people that you’ll never meet again might say something that becomes a massive part of your subconscious. We pick up subconscious messages from the TV shows that we watch and it really is hugely important that we challenge these subconscious assumptions and messages that we have received that actually govern the way we act. So I thought I’ve talked through a few subconscious assumptions that I commonly come across as a wealth advisor, what I would like you to do though is put me on pause and jot down a few of your assumptions and spend some time really thinking deeply on this. But for those of you who are doing a running race or who are listening to me on the treadmill or who are driving, please don’t stop down and jot anything. Just carry on what you do. So the most common assumptions that many people make about kind of their living now. The first one is this small amount of time spending won’t matter in the long run. And I did a video and a blog and a series on 200 rand, which is roughly $18, $16, $18. And I did a series on how 200 grand can become $4,500,000 rand through the power of time and compound interest. And it sounds so little money. It’s less than four or five cappuccinos. It’s a tiny amount of money to so many people. Yet that 200 grand accumulates. And when I was doing the helping our helpers’ course, the example we gave is that many times when you go to a building site, so people who are laborers, you will find a whole heap of coke and Fanta bottles and other types of fizzy drinks. And I made the point that those cost 15 rand, so if you’re having one a day or even 20 a month or whatever it is, you’ve got 300 rand that you could put aside and save and overtime would make a huge amount of money. And there was kind of like this AHA thing of the fact that there is a lot of money that we spend that actually makes a difference in the long run. The second assumption that people make that impacts them is that we look around and we think that there is permission by other people having stuff. there is permission to buy more expensive cell phone. There is permission to buy a new handbag because so and so bought a new handbag. So why can’t I. That by others having something we assume that we’re in the same position as they are and kind of linked to that is assumptions that we make about largest spend items. So those might be smaller spend items. There are assumptions we make about largest spend items such as if I drive a small car, people weren’t giving me the same credibility than if I drive a big car and I can tell you honestly, it’s one of the things that really does play in my mind. I drive a very small Honda jazz mostly because I’m not a great parker and I like having a small car, but also because it’s very fuel efficient. It’s got seven airbags and it’s expensive to buy bigger costs, but I can tell you that I often think about getting a new car and the main reason, my dad always used to talk about the good reason and the real reason. The main reason is because I wonder if I rock up at a client’s house in my small little Honda Jazz, will they think that I haven’t made money myself. What does she know about managing my money because she could only afford a Honda Jazz. And it does, it plays on me a lot, but I’m committed to not spending money when I’d rather invest it or save it. My dad when he retired after the age of 70, bought his first Mercedes Benz and he bought this great little car that is really divine and part of his logic was I have spent the first 17 years of my life frugally saving for retirement. I know now that I can afford to buy this. Whereas when I was 40 I didn’t know whether I could afford to buy this and I think that’s fantastic and probably I’ll be the same. I’ll drive my first luxury car when I’m that age. So that’s one of the other things is that we assume that people will think badly of us if we have a small car. The flip side of it is that we assume that people are wealthy when they drive a Porsche and I can tell you as a financial advisor that that is not the case. In some cases it is people are very wealthy and for them to own a Porsche is the same as for me to own a Honda Jazz, but there are many times when the things that we see are not the real story. That their income is going to expenses and not to assets that are earning money. So these assumptions that we make often change the way we live. They often influence the decisions that we made that if we had our assumptions correctly grounded, we wouldn’t do stuff. People assume they’re getting a bonus, so they spend ahead of their bonus. People assume that their jobs will last forever because they’ve already been there for five years. So there job is safe and the next thing they face retrenchment. We all assume that we are not going to die tomorrow because we have our health and only old people die, but we also can assume things like, well, I’m going to make a big one day so I don’t need to worry about saving now. Or I need to give up everything I have for my children. And it’s an assumption I’d like that we’ve been told is what constitutes a good parent, a good parent or someone who gives up everything to give the base to their children and I kind of am in the yes or no category. I subscribe to that philosophy when it comes to education, but I don’t think it’s necessarily true for every single thing. And I believe that often we protect our children from creating the best life for themselves because we’re so busy spoon feeding them everything that they never learn to build the muscle and the strength to do it for themselves. And these assumptions limit us. They stop us from living our best life possible because we wake up one day and we don’t have enough money to save for retirement or we’ve spent it all on people who might think that now we’re at. But actually they’re all gone because you change school and they no longer are the parents of the kids around you now. In actual fact, if we lived more mindfully and more consciously and we were much more aware of the assumptions that we’re making and tested them, every time we made a decision, we might choose a different path and the more time you have to choose the path of life you’re on, the longer that you’re going to be on the best path for you, and I see many of those assumptions when it comes to retirement planning. I’ve visited clients so often who when I tell them that they don’t have enough money for retirement, they look at me and go, but I’ve been contributing to a company retirement scheme for my whole life. How can I not have? And the reality is that that assumption is based on the fact that firstly, the company is deducting enough money for you to save. And in my experience, the company only detects between 8% and 14%. And for most people, if you start saving from the very day you start working, the very first day, you need a minimum of 15% for retirement. But most people don’t. Most people have longer education and spend a lot more time in university than that assumption is based on and have a lot more debt to pay off student debt and other debt to pay off so they’re actually only start saving for retirement in their 30s or 40s, in which case they should be saving 25% to 35%. And so the assumption that the company’s taking the right amount of money is an incorrect assumption and you should change your behavior by understanding how much money you personally need to save. The second assumption is that the company is investing your money or the financial advisor or the preservation fund that you are in, or whatever it is that someone is investing your money with the correct growth rate for you to retire. And in the correct investments and in the correct cost structures. And the reality is there are many times when I find a client who has been investing into retirement fund for the last 15, 20 years, that someone that they can’t even remember who told them was a good thing. And 20 years later they’ve had 1% growth a year. And I can do nothing about their past and they look at me like, how can that company not have made money. And I was like, well, the fund has made money but they’ve charged you so many fees that you actually at the end of the day, don’t have that much growth on your money. So don’t make the assumptions that your retirement funds are being invested correctly. You’re getting the growth rate and the right amount of money has been invested in the first place. Do your homework, know the answers to those three questions and make sure that you act and invest time to find the right people to advise you. Many people when it comes to saving for retirement, put that on hold whilst they build young families. And this comes onto the question of a need to give absolutely every single cent to my children to make sure they have a great life and don’t miss out because everybody else’s children are going on holiday. So mine should too. And the answer that I’d say to you on that one is that you need to continuously save. I know children are expensive. I have been through three of them. I’m acutely aware, but even if you have to drop the level of savings, don’t drop it to not, continue to save and invest for your future because the longer time you’re money has invested in actual fact the less in absolute terms you need to save. The other thing that I see very often, particularly for women and especially an older woman in the generation where men take care of the money, is that they assume that their partner has the retirement fund sorted and this is not a good assumption to me. You need to have discussions with your partner as to how are you saving for retirement? How much is there and how does he knows that it’s going to be enough for you guys to retire? Because the bottom line is that so often this conversation is never had and it breaks my heart because you get to 60, you both retire and then at that point his savings comes out of a company pension fund and you go and see a financial advisor and you as the wife haven’t worked for the last 20 years. 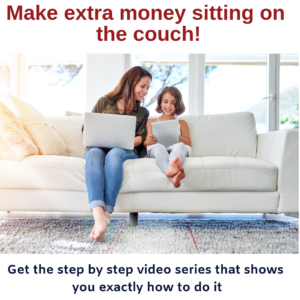 You stopped working at 40 and their financial advisors is you don’t have enough money to retire and it comes as a shock at 60 where if you had that conversation at 40, you could have found something to do and started building that next stream of income so that you had the choice to do something different. Now, both of you need to go and find jobs and it’s a really tough thing at 60 to start working. It’s a lot easier at 40, so don’t make the assumption that your partner has it sorted and similarly, don’t make the assumption that your kids will be able to look after you, God willing they will. But what happens if they don’t have enough money? Would you take the money from your grandchildren to survive because you haven’t done enough planning when you know that money should be going to your grandchildren’s education? Most of my clients say never. I don’t want to, that money should be for my grandchildren. I’d rather live in poverty and so that assumption that your children will be able to look after you assume that they’re going to have enough spare cash to be able to do that. And the other assumption that I see a lot is the assumption that you’re going to die young. My parents died at 60. I’ll die at 60. My parents died at 70, I’ll die at 70. And not only are you’re going to die young, you’re going to die in a heart attack and die immediately. And I helped my mom and her sister with the day to day looking after of Migraine after she had a stroke and I always say to my clients and my friends and family, God willing we all just one day fall asleep and never wake up because that is definitely the best way to go because it’s an incorrect assumption that we’re gonna die certainly. The large portion of expenses in retirement goes to health and medical support and often that’s because people have had a stroke or they get dementia or something happens and they need to be into a care home or a frail care. And also what happens is that people in their 70s go, I’m just going to drop dead one day and they don’t even put their names down for retirement villages or frail care, and so you don’t have the option of a great cheaper one. Your kids end up having to put you into a frail care in a very expensive one because those kinds of decisions weren’t made consciously. They were made subconsciously. And for many people they say, well, I’m going to have my expenses in retirement. I have so many clients who say that, and there are a couple of problems with that assumption. The first assumption is that by moving into a smaller place that it’ll be less money. And often when you go from a freestanding house into a complex or cluster, it comes with more expensive, for the security, for the state, for all of that kind of stuff, which you didn’t have when you had your own bigger freestanding house. The other thing is that retirement villages are expensive, around the world there is a global shortage of retirement accommodation and retirement services and when you put frail care into that assumption, that’s a massive expense and my grandmother is 96. She’s most phenomenal woman. She has always lived independently and then she recently had a car accident and needed to go into frail care. So it doesn’t matter how independent and strong and healthy you are. Stuff happens. I mean this wasn’t I always think that a 96 year old should be exempt from car accidents. You’ve done your time. You shouldn’t be in that kind of situation, but it happens and you need to go into frail care. So you might be a healthy stallion and never smoked and eating roots and shoots your entire life, but you don’t know what’s going to happen to you and you don’t know what kind of care you’re going to need. So assuming that your expenses will have and you can release capital from a house, it’s not always the right assumption to make. And regardless of what the circumstances are, or regardless of what your assumptions are, I really would love to implore on every one of you to take some time to be more mindful of the assumptions that you’re making. Really reflect deeply. Why do I think this? What I think about this? When I look at people who are retired, what do I think? When I look at old people, what do I think? Do I think that they just got there because of bad genes, good genes, bad management, good management. What are the assumptions that you’re making and how is that impacting the way you are saving for retirement, the way you are living your life now, the way you deal with your family, your friends, your money, the amount you spend on your children, whatever it is. This isn’t a question of what is right or wrong, it’s just more a question of what are you thinking and how does that change your behavior? Because once you start to examine it, once you become consciously aware of staff, you are then able to decide whether you want to change it or not. That assumption might be true. You might look at that assumption and think, actually, I really believe that. Then that’s great. Then carry on doing it, but you might also look at that assumption and go, where did I come up with that? How am I doing it? That kind of thinking and have those hard conversations. 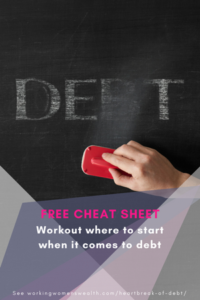 I financially coach many couples with my whole brain thinking work and I have come to believe that there are very few of us who have the conversation about retirement and assumptions with our spouse because in actual fact, we’re really scared about that. So be brave, have courage, act on your thinking and your assumptions and make sure that you give yourself the chance, the time, the opportunity to live your best life possible. I’m Lisa Linfield and this is Working Women’s Wealth. Please subscribe to our podcast. It’s that little button in iTunes that say subscribe, because it’ll help us to get you the information that you need to live your best life possible. Take care and have a great week.